Anyone who's watched the 2010 documentary "The Cove" knows about the horrific dolphin hunts that happen in Taiji, Japan. Each year, Japanese fishermen capture hundreds - if not thousands - of wild dolphins by chasing them with boats, and hitting metal poles with hammers to create a wall of sound that traps the dolphins. Once the hunters drive the dolphins into the cove, they slaughter them for their meat. The best-looking dolphins - that is, the ones who look like Flipper - are sold for large sums of money to dolphinariums, aquariums and swim-with-dolphin programs around the world. In January 2014, the hunters spotted a rare albino baby dolphin swimming with her mother in a pod of about 150 dolphins. Knowing this dolphin would be extremely valuable as an aquarium exhibit, they drove the pod into the killing cove and caught the albino baby in a net. The baby dolphin was then motored to the nearby Taiji Whale Museum, a place notorious for keeping marine mammals in tiny, chlorinated tanks. 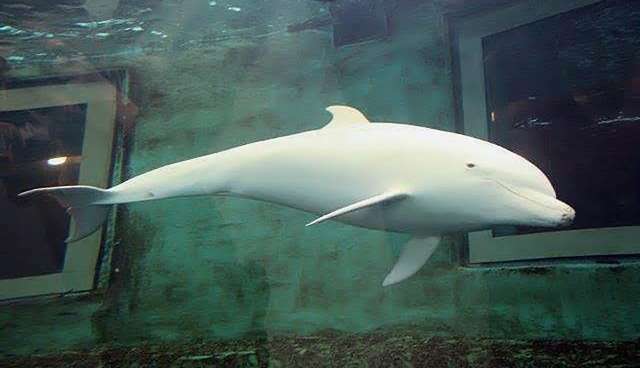 The albino dolphin - named Angel by activist Ric O'Barry - gained international coverage when she was first captured by the Taiji Whale Museum, and caused outrage from animal lovers concerned about her well-being. Representatives from Australia for Dolphins (AFD) tried to monitor Angel's condition in the museum, but museum officials denied them entry. With the support of Ric O'Barry, Save Japan Dolphins, and the Earth Island Institute, AFD filed a lawsuit against the Taiji Whale Museum for discriminating against westerners, and not giving them the same access to the museum as Japanese nationals. Now the judge has made a ruling in the activists' favor, and AFD has announced that this decision will aid the ongoing battle to have Angel relocated to a sea pen. 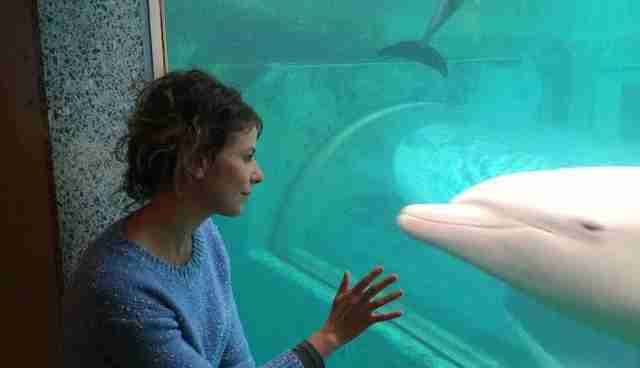 Sarah Lucas, CEO of Australia for Dolphins, first visited Angel shortly after the dolphin's capture. Angel was initially kept in a small outdoor swimming pool, where she could do nothing but swim in small circles. "The most heart-wrenching thing was seeing her all alone," Lucas tells The Dodo. "I think it must have been so traumatic for her to be taken from her mother, and suddenly thrown into alien conditions. I felt very sad for her." Angel was eventually placed in an indoor tank with four or five other dolphins, but, as Lucas explains, this hasn't improved her welfare. "There's very little space," Lucas says. "In the wild Angel might have swum 100 kilometers [62 miles] in a day, but she now has to swim in awkward circles trying not to hit the edge of her tank. The tank is barren, and completely devoid of stimuli." Not surprisingly, Angel and her tankmates have become extremely frustrated. Lucas says that Angel has "rake" scars on her skin, probably from dominant male dolphins attacking her. Angel's tiny tank is also filled with chlorinated water, which is extremely bad for any cetacean, causing eye irritations and other health problems. 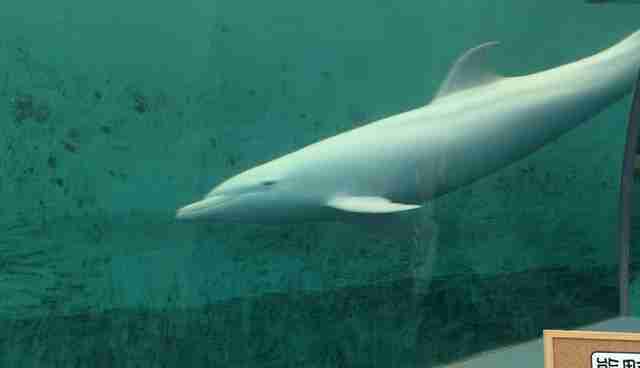 But as an albino dolphin, Angel is particularly susceptible to these eye problems. "She often has her eyes closed," Lucas says, "perhaps because the chemicals in the water are too harsh." After losing the lawsuit for discrimination against westerners, the Taiji Whale Museum has been ordered to pay AFD 110,000 yen, which equates to only about $972. Now Lucas is asking representatives to use the money to relocate Angel into one of the sea pens the Taiji Whale Museum has at the front of their property. "I do have real hope that she will be released in time to a sea pen," Lucas says. "It's actually in the museum's best interest, if they want Angel to have a long life." Despite this glimmer of hope, Angel is still the museum's property, and it's possible that they will choose to keep her on display. "No one is sure yet whether Angel could be released into the wild," Lucas tells The Dodo, "but we think a sea pen with adequate shade cloth would be much more humane than her current tank. She's never going to playfully swim in the ocean with her mother again, so we have to focus on trying to give her the best life now that we can." You can donate to the Dolphin Project to support their ongoing efforts to end the Taiji hunt.